You know the old saying, “Necessity is the mother of all invention?” It is certainly true. I have been “off coffee” for almost a year now, which is incredible since I live in the undisputable coffee capital of this country. But, I kicked the habit when I was trying to heal my thyroid and very rarely have real coffee these days. I genuinely like the taste of brewed coffee though, so I do have decaf every so often. 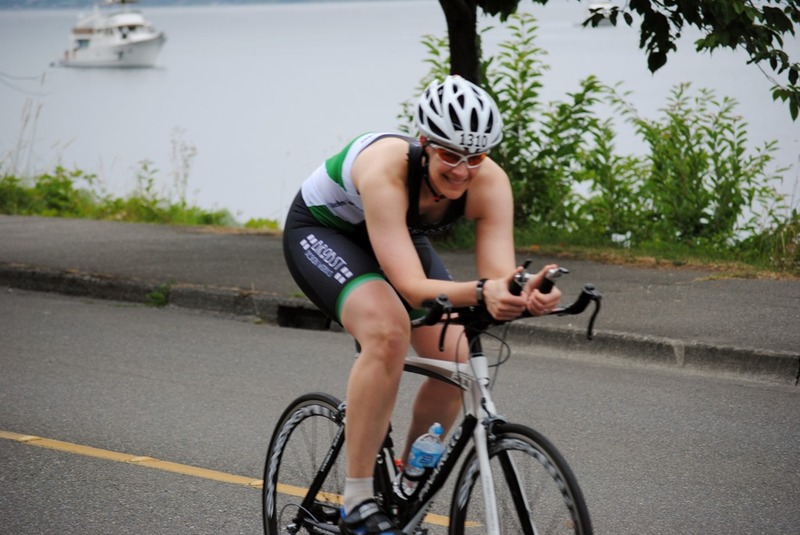 However, I raced the Seafair Triathlon over the weekend, and, it’s a pretty well known fact that if you’ve been off caffeine and then re-introduce it, say on race day, you can experience an ergogenic effect. Translation: It can make you a little bit faster with a little more endurance. And, let’s face it, I need all the help I can get! My coffee vacation has been so long, in fact, that I completely forgot that Trader Joe’s sells whole beans, and you need to grind them before you leave the store. Whoops. I bought a can of organic French Roast – I prefer dark coffee – and realized when I got home that I had no idea where my coffee grinder is. It’s probably packed away in some random box in storage with most of our stuff. Anyway, what was I to do with a can of whole coffee beans the day before my race? 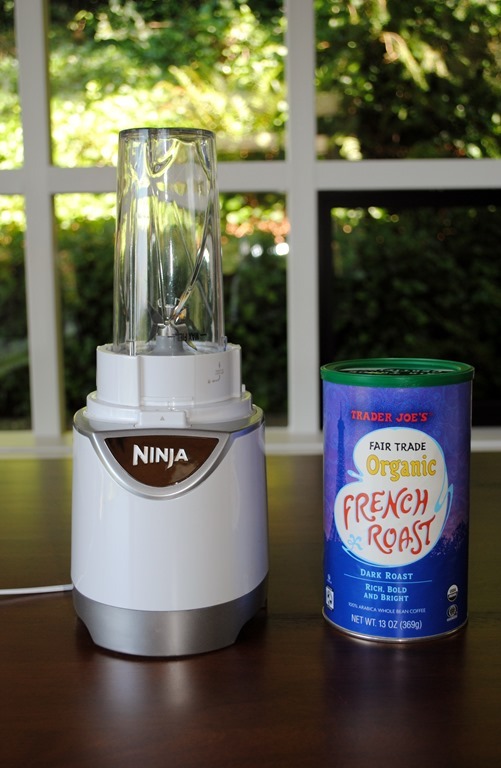 A light bulb moment hit – I own the mother of all blenders (well, as you know, I own several varieties of said blender.) Why not just grind it in a single serve cup? 10 pulses later, voila, usable ground coffee. I’ll show you how to do this below, but before I get to the instructional, I just remembered an amusing story. A few years ago, my mother was in town from Texas. I walked into the kitchen one morning to see her adding water to a cup of my freshly brewed coffee. “Your coffee is SO strong!” she replied. 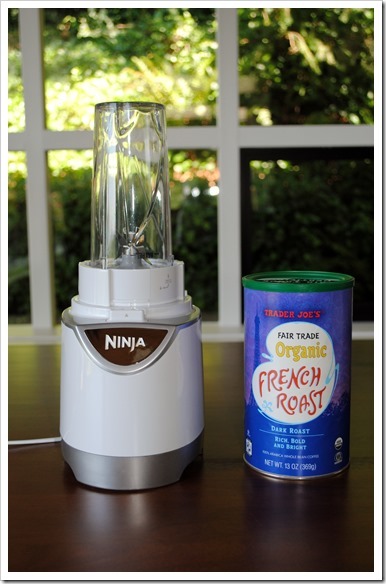 Any Ninja Blender will work, but if you have a single serve cup, that is preferable as it will give you a finer grind – and you will be able to control the end result much more. Meaning, if you like a super fine grind, you can get that, or, if you want a coarse grind, you can get that as well. 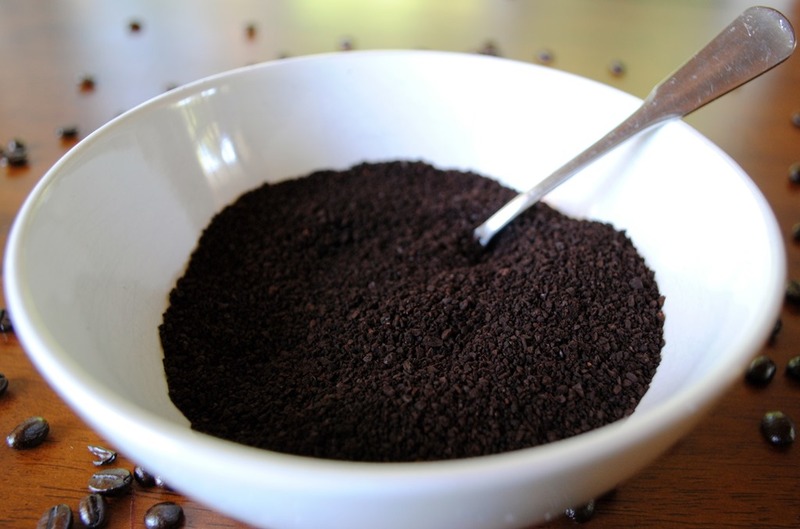 If you are using a single serve cup, don’t add more than about 3/4 to 1 cup of beans at a time, as too many beans will give you different size granules due to the volume in the cup. If you’re using a standard pitcher, you should add at least 1 cup, as you need the volume to blend, and instead of pulsing, you’ll steady state blend on “1” for about 20-30 seconds or until you get a consistency you like/your coffee pot requires. 1) Obtain your preferred coffee and prepare your blender. I used the Ninja Pulse for this because it was handy. As I noted above, any Ninja will work, just take the precautions I called out depending on your selection of single serve cup or pitcher. 2) Fill the container based on the type you’re using. I filled my single serve cup with about 3/4 a cup of beans. 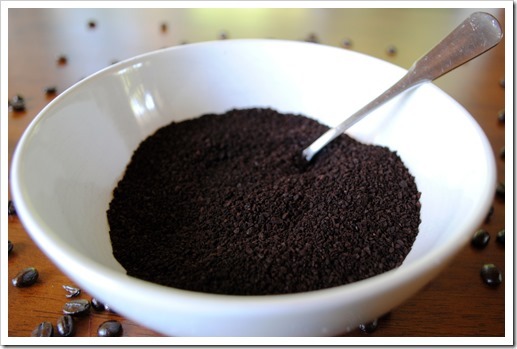 3) For a single serve cup, pulse 8-12 times, or until you get the coarseness or fineness of grind you prefer. 4) Go brew your coffee already! For comparison’s sake, here is a before and after when I used the 40 ounce pitcher. See, still works – just perhaps not as fine in the end. This was after about 20 seconds of continuous blending – you could keep blending to make it smoother, but it won’t get as smooth as if you had used a single serve up. 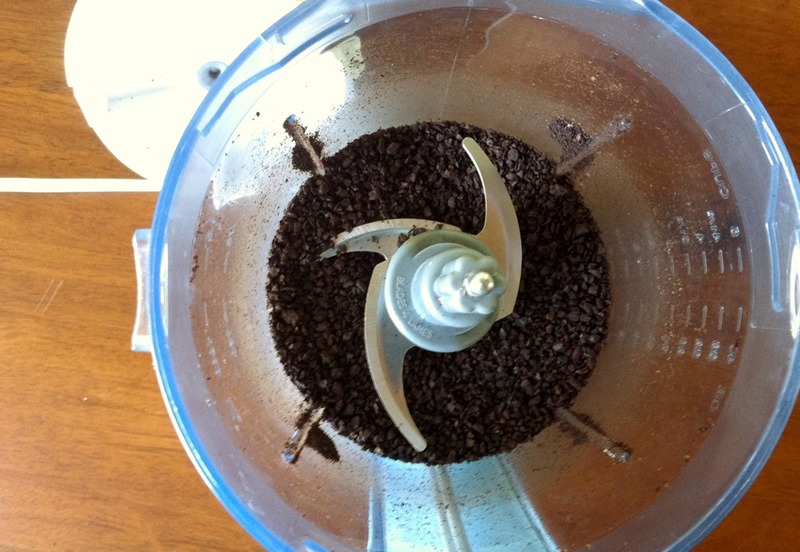 The bottom line is you can turn whole coffee beans into ground coffee with any Ninja Blender, and it is a fast process. Not a coffee drinker, but do you think it made any difference to your race performance? And we must be in sync. I was just looking at the beans at TJ’s this weekend. My hunny is the coffee drinker, and we used to buy kcups for cheapo because he was in the biz. Now that we’ve run out of our hoarded supply, I ordered him a reusable kcup and will need to find coffee. I noticed that TJ’s sold the beans, but I didn’t notice the grinder. Thanks for mentioning it. I’ll have to look next time more closely. I think so, probably only because I had to wake up at 4:30 a.m.! I genuinely needed it to wake up. 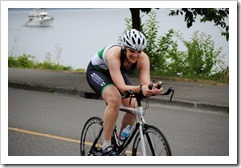 But, I had a very good race for me, so, yeah, to some degree I do think it helped. SWEET! Since I’ve gotten my Ninja Mega Kitchen System 1500, I’ve gotten rid of my old blender, food processor, and mini-prep food processor. 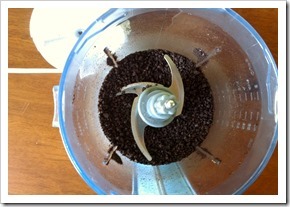 Now I know I can get rid of my coffee grinder too (and apparently I have two of them … I have no idea why). Thanks so much for this post!!! Ninja products rock.. I have the pulse, the mega kitchen and 3 in 1 cooker and have the 4 in 1 cooker on order.. I use them every day for one thing or another.. I kept my vacuum sealer but got rid of all other appliances including the kitchen aid mixer.. 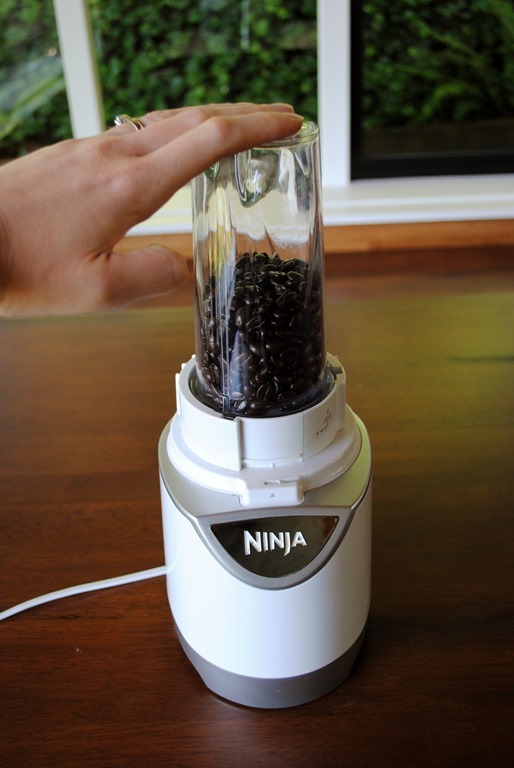 I am a firm believer in ninja..
I’m considering buying the Ninja Kitchen system. Been looking all over the net for review. Yours seem to be the most extensive one! Keep up the great work. One thing I need to make sure of is do they grind sesame seeds? I hope you can see this comment. I look forward to your response. When you say ‘grind’ sesame seeds, are you wanting to make flour or butter? I will give it a try for you, but I am confident that the single serve cup will do what you want. I wouldn’t try to grind sesame seeds in the large pitcher because they are so small and the blades are really big. 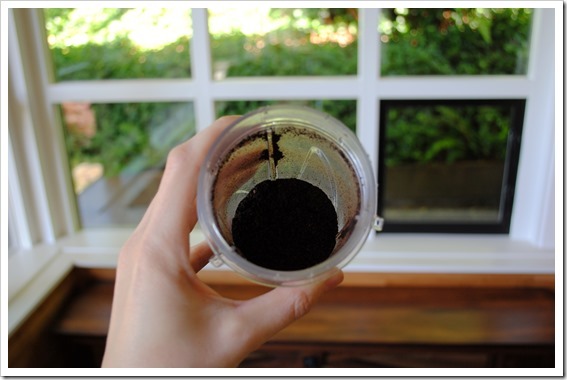 The single serve cup is really competent at grinding things (check out my post on grinding coffee beans or making cashew butter for similar examples). Thanks for the “speedy gonzalez” reply!! I would like to make sesame paste which is used as a filling for glutinous rice flour balls, a Chinese dessert. I would need to toast the black sesame seeds first, then grind them. They need to be really fine; so I suppose flour-like. Then I fry the sesame flour with oil and sugar to make the paste. I hope you know what I mean. Thank you so much for trying it out for me! Let me know how fine you can grind the seeds to. Now looking forward to your report! I’ll work on this over the weekend for you – I need to run out and get some seeds, and will write up a post with pictures. 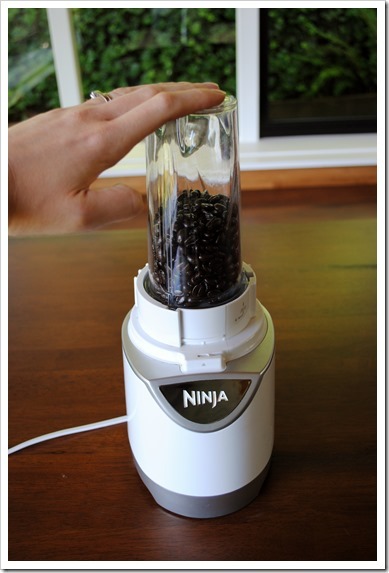 Yes it will grind sesame seed..
Dont waste your money on any Ninja products, Make an investment in a Vita Mix blender -youll never regret it. Ive been in food & beverage for forty years and nothing matches vitamix for blending pureing or food prep. Sorry, I was looking at your reviews and I’m thinking now maybe the Ninja pulse is better. Do you think it can do the job of grinding sesame seeds as well as make ice cream? Sorry for the confusion! I think the Ninja kitchen system maybe too big for me afterall. Thank you so much for your passion and helpfulness for your readers. I definitely think the Pulse will do what you need/want it to! I ordered up some black sesame seeds today (the power of Amazon.com) and they will be here Saturday. I’ll do the little test with the Pulse (I will be using the single serve cup for this project), and am planning to post the results on Tuesday. How long do you toast the seeds for? You are like a fairy godmother – wow! Ask and your wish will be there the next minute! Ha! I just lightly toast the sesame seeds, as long as they are not raw and a bit fragrant, they are done. They burn easily so be careful! Can’t wait for the results! Great, thanks for the direction! The seeds came today, so I’m looking forward to experimenting! My ninja pulse did not come with a single serve cup or multiple settings. I have a smaller cup than the pitcher, but it is still about 5 in in diameter and holds a cup easily. Any suggestions on getting a finer grind? You should be able to use that smaller cup to grind the coffee. 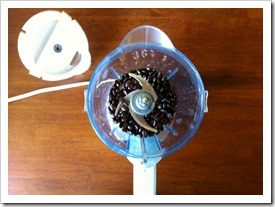 Add the beans and pulse a few times to chop up, and then steady state blend until you get a grind you like. 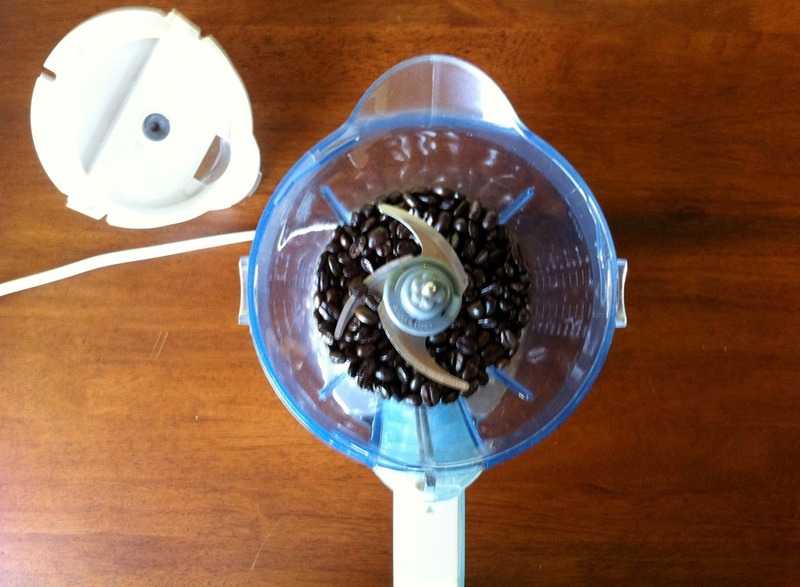 The more volume of beans the better, as that will help you get a finer grind. Hope that helps! quite a long time ago, don’t remember where. smaller cup one, and have to continue searching for it. I always use scads of milk in my coffee, I think expresso is what I want. I will re-contact you if I find the cup container. I did leave one above. 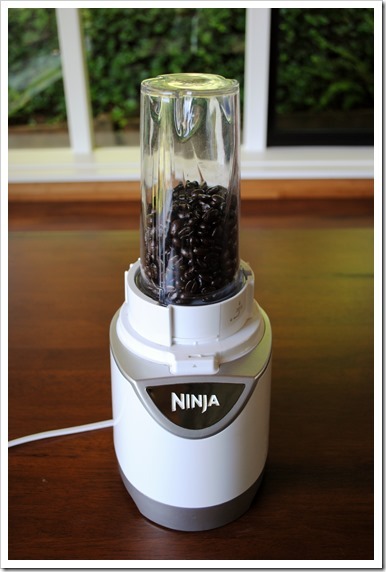 Renee, I also have a Ninja Express Chop………did it work to grind your coffee beans? Were they ground fine enough? I do think it will work, but you wont get a terribly fine grind. The blade design is similar to their blenders, so it should chop up the beans, but they will be fairly coarse. Thank you for this post! I just switched back to drip coffee and was about to stock up on TJ’s but then realized/remembered (as you did) that they sell in whole beans and I wondered exactly if I could use a Ninja since I don’t have a coffee grinder. Can’t wait to pick up some beans at TJ’s and give this a whirl! Thanks for the note, Stephanie! I hope it works out for you! 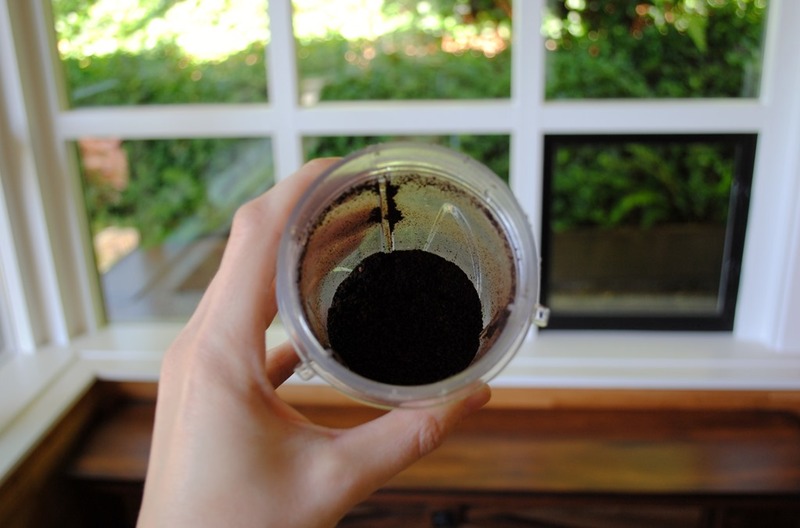 Will grinding beans in the single-serve cup ruin the clear interior of the cup? I ask this because, I needed to grind A LOT of black peppercorns to rub onto a whole pig I roasted this summer. Using the single-serve cup, I ground it all up nicely, but completely ruined the interior of the cup to where it’s opaque. Just curious if the coffee beans will do the same. You know, I think that opaqueness just comes from use of the cup. Mine is cloudy, not completely opaque. My guess it’s just a result of the plastic container getting scraped over time (and hundreds of uses!). Coffee beans aren’t as abrasive as peppercorns, but yeah, I’d say a similar effect could happen. I used to have a coffee grinder and the plastic cup on it turned slightly opaque! I saw this post as I was googling options to grind my coffee after I broke my coffee grinder trying to grind too many beans at once. Oops! I’m a hoosier but I’ve lived in Spokane, WA, and I definitely lean more to the northwest when it comes to coffee. I won’t be replacing my grinder anymore… Thanks for the tip!